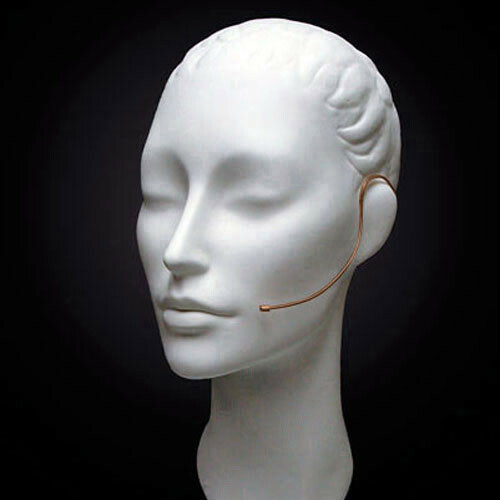 The cocoa E6 Directional Earset Mic, Medium Gain, with Detachable 2mm Cable and TA4F Connector for Shure Wireless Transmitters from Countryman is a vocal microphone with an adjustable boom that weighs less than one-tenth ounce. It can be used on either ear for capturing audio and rejecting unwanted sound, feedback, or surrounding noise from stage monitors or nearby speakers in houses of worship, theater, and outdoor vocal and speech applications. In addition, the E6 Earset features a pattern-changeable directional microphone for maximum isolation and gain before feedback, but is available as a water- and wind-resistant omnidirectional microphone too. This directional E6 Earset's cable terminates to a TA4F connector for direct connection to a Shure AXT100+, BLX1, FP1, GLXD1, PG1, PGX1, PGXD1, QLXD1, SLX1, UC1, ULX1, ULXD1, UR1, or UR1M wireless bodypack transmitter. E6 Directional Earset Mic, Medium Gain, with Detachable 2mm Cable and TA4F Connector for Shure Wireless Transmitters (Cocoa) is rated 5.0 out of 5 by 2.